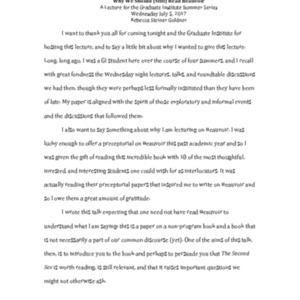 Audio recording of a lecture given on August 1, 2018 by Ed Sarkis as part of the Graduate Institute Summer Lecture Series. Audio recording of a lecture given on July 25, 2018 by Kathleen Longwaters as part of the Graduate Institute Summer Lecture Series. Audio recording of a lecture given on July 18, 2018 by Anthony Eagan as part of the Graduate Institute Summer Lecture Series. Audio recording of a lecture delivered on July 11, 2018 by Elliott Zuckerman as part of the Graduate Institute Summer Lecture Series. Does the Declaration of Independence speak to us today? Audio recording of a lecture given on July 4, 2018 by Elizabeth Eastman as part of the Graduate Institute Summer Lecture Series. 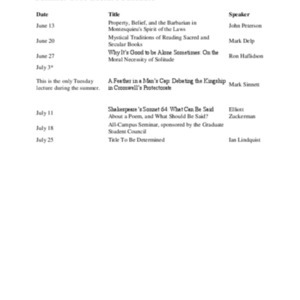 Audio recording of a lecture delivered on June 20, 2018 by Mark Delp as part of the Graduate Institute Summer Lecture Series. 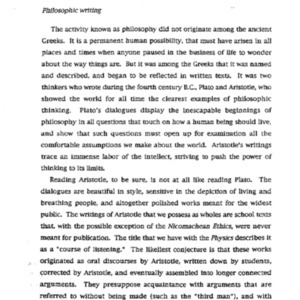 Logic, nothingness, and the university : on the different versions of Heidegger's "What is metaphysics?" Audio recording of a lecture given on June 27, 2018 by Ian Alexander Moore as part of the Graduate Institute Summer Lecture Series. Schedule of lectures and concerts in Summer 2018, sponsored by the Graduate Institute. Audio recording of a lecture delivered on June 13, 2018 by John Peterson as part of the Graduate Institute Summer Lecture Series. 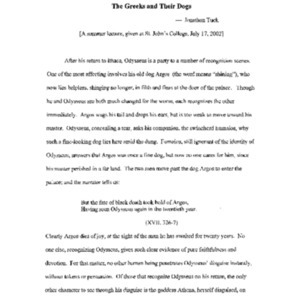 Typescript of a lecture delivered on July 17, 2002 by Jonathan Tuck as part of the Graduate Institute Summer Lecture Series. Typescript of a lecture delivered on August 6, 1983 by Joe Sachs s part of the Graduate Institute Summer Lecture Series. Audio recording of a lecture delivered on July 26, 2017 by Naomi Baron as part of the Graduate Institute Summer Lecture Series. Audio recording of a lecture delivered on July 13, 2017 by Charles Zug as part of the Graduate Institute Summer Lecture Series. Audio recording of a lecture given on July 19, 2017 by J. Walter Sterling as part of the Graduate Institute Summer Lecture Series. Audio recording of a lecture given on July 12, 2017 by Robert Richardson as part of the Graduate Institute Summer Lecture Series. Audio recording of a lecture delivered on June 28, 2017 by Joseph Trullinger as part of the Graduate Institute Summer Lecture Series. Audio recording of a lecture delivered on July 05, 2017 by Rebecca Goldner as part of the Graduate Institute Summer Lecture Series. Typescript of a lecture delivered on July 05, 2017 by Rebecca Goldner as part of the Graduate Institute Summer Lecture Series. Audio recording of a lecture delivered on June 14, 2017 by Matthew Reiner as part of the Graduate Institute Summer Lecture Series. 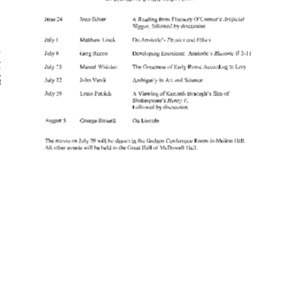 Schedule of lectures and concerts in Summer 2009, sponsored by the Graduate Institute.